Extensive parklands surround the castle to the south and east, bordered by the river Peffery. They are used in part for grazing prizewinning Aberdeen Angus cattle. These ‘Policies’ include a fine woodland walk with the important trees marked. 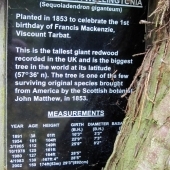 They include the famous Spanish or Sweet Chestnut planted in 1550 for Mary Queen of Scot’s mother, Mary of Guise. 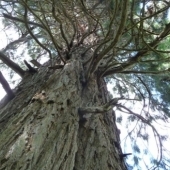 Behind the castle to the north lies a pair of Giant Sequoia, the one on the left is the largest tree in Britain in terms of bulk and is supposedly the largest in the world at its latitude. 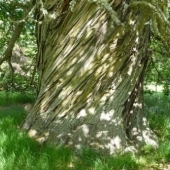 Both it and the Chestnut are well known and included in the book ’100 Best Trees of Scotland’. To the west lies further woodlands, The Countess’s Well, and, nearer to the castle, the Rose Garden.